As with high fashion or sports cars, when the world speaks of racing bicycles the conversation soon turns to Italy. A gorgeous new hardcover book Italian Racing Bicycles: The People, The Products, The Passion traces the rich history of 40 landmark Italian cycling brands that are intimately connected with racing. Tracing their lineage back more than 100 years to the early days of the velocipede, Italian Racing Bicycles reveals how these manufacturers have evolved into the brands beloved by the world's cyclists today. 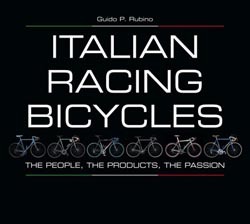 Italian Racing Bicycles is now available in bookstores, bike shops, and online. Download a free preview at velopress.com. Seasoned cyclists know that an Italian bicycle is more intimately yours, a more personal possession, than a bicycle of other origin. Italian bicycles are built to race with passion-and to win. Their makers also share a hunger for advanced technology, pushing engineering to new heights with exotic metal alloys, elaborate weaves of expensive carbon fiber, and aerodynamic studies that help their bikes and riders cheat the wind for greater speed. Beyond these commonalities, though, the stories diverge. The restless inquisitiveness of Ernesto Colnago could not be more different from the methodical calm of Ugo De Rosa, for example, and yet these two iconic frame builders contributed immeasurably to the racing victories of the great Eddy Merckx. The passion for experimentation of Pinarello, the brazen creativity of Cinelli, the barrier-bursting hour machine of Moser-in search of racing victories, the volcanic inspiration of Italian artisans has repeatedly reshaped the dynamics of the sport of cycling. Melding painstaking historical research with personal visits to each artist's workshop, author Guido P. Rubino has unearthed the stories, the methods, the dreams, and the personalities of these cycling firms, large and small, that have contributed so fundamentally to the glory of the sport. The brands: 3TTT, Alan, Ambrosio, Atala, Bianchi, Bottecchia, Campagnolo, Casati, Cinelli, Colnago, Columbus, Daccordi, Dedacciai - Deda Elementi, De Rosa, Ganna, Gios, Gipiemme, Guerciotti, Legnano, Masi, Miche, Milani, Modolo, Moser, Olmo, Olympia, Passoni, Pegoretti, Pinarello, Rossin, Scapin, Selle Italia, Selle Royal-Fi'zi:k, Selle San Marco, Somec, Tommasini, Torpado, Universal, Viner, Wilier Triestina. Hardcover with jacket, 230 color and b&w photographs throughout. Guido P. Rubino has been writing about cycling technology since 1996, with articles in such magazines as BiciSport, Cicloturismo, and MTB Magazine. He is the coauthor, with Paolo Faccinetti, of Campagnolo: 75 Years of Cycling Passion and author of La Bicicletta da Corsa and La Mountain Bike. Learn more about Rubino at guidorubino.com. VeloPress publishes books for cyclists, triathletes, and runners on training, nutrition, and the histories and personalities of endurance sports. VeloPress is a division of Competitor Group, which publishes Velo, Triathlete, Inside Triathlon, and Competitor magazines and produces the Rock 'n' Roll Marathon series, TriRock triathlon series, and the Muddy Buddy adventure race series. To sell Italian Racing Bicycles in your store, please email wholesale@competitorgroup.com.